Discover Scuba Diving…. Try scuba for the first time and open yourself to a great new world!!! There is nothing like breathing underwater for the very first time. It takes a little getting used to – after all, human beings weren’t designed to do that – but after a few minutes of awestruck wonder, most participants realise how easy scuba diving really is. The biggest challenge instructors have with the Discover Scuba Diving programme is not coaxing participants into the water, but coaxing them out when the experience is over. 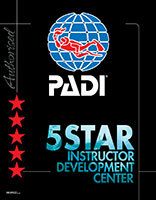 Get Certified as an Open Water Diver & Dive the world! Technical Diving is diving other than conventional commercial or research diving that takes divers beyond recreational diving limits. It is further defined as and includes one or more of the following: diving beyond 40 metres/130 feet, required stage decompression, diving in an overhead environment beyond 40 linear metres/130 feet of the surface, accelerated decompression, and/or the use of variable gas mixtures during the dive. Let us take you underwater! Come dive with us! When it comes to fun dives; our goal is to provide you with maximum enjoyment from a diverse list of dives sites, and the safest diving conditions.